внушительно | Wheat, Not Oats, Dear. Sleepless nights are the devil’s own, I tell ye, and I’ve been having them lots and lots lately. I had one just the other night. I couldn’t locate sleep on a map, a detailed map with topographical details and vivid red arrows that pointed to “Sleep: two nautical miles” and “Sleep: this-a-way” and “Sleep: look here, cowpoke, a whole Great Plains of slumber”! I do not know when I finally went unconscious, but the next day was a slog through the salt mines, and make no mistake. At one point I referred to my skeleton as “glue”, if that helps “paint the picture”. What does “subaltern” mean, again? When I woke up, apparently having nodded off, it was from a dream that I could set things on fire with my mind. 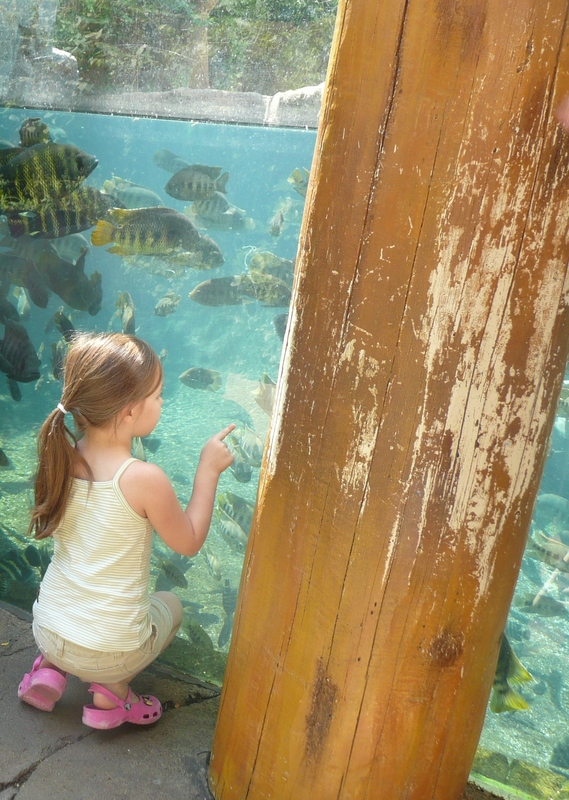 My niece, examining fish at the St. Louis Zoo. The word limn means “to represent in drawing or painting” or “to describe”. It can also mean to “trace the shape of”. I am in love with this word of late. It’s a lovely word. Limn limn limn, I am always thinking. Limn it up. In my girlhood, there was a solar eclipse. Our teachers–for reasons best known to themselves–decided to let us outside to watch what was happening through our specially prepared “pinhole” boxes. I remember strange shadows and squirrels running mad in Craig Park, which is next to my old elementary school. [O Craig Park! If parks could talk, gentle readers. If parks could talk.] I also remember another girl brazenly examining the sun with her bare eyes. “Brazen!” I thought, and then I probably thought: “What does ‘brazen’ mean?”, because I was a kid, for God’s sakes. Where will I be in my life on July 2, 2019? Or on November 13, 2012? Where will you be? Do you know? You do? I ought to get cracking then, oughtn’t I? Nor earns salt pride braving the long sea-sweeps. In the dogwatch already, hiding the Dog Star. We have been drifting. It would be near noon. Will not cloud over if looked at long enough? Not hard enough have we wrought our homing. Drifting itself now is danger. Where are we? Even in this blindness which way deep water lies. For midsea, where the winds are and stars too. Or founder soon, we cannot be saved here.